A fun party idea for older children or even adults is a car scavenger hunt where teams must travel together around the city to take various pictures and pick up various scavenger hunt items. This is a fun game for graduation parties, stags/stagettes, or a birthday party. Try not to disturb businesses with the game & be respectful of their space and time. You’ll want to set rules such as: all team members must stay together (can be proven through pictures during the scavenger hunt) and you can set a time to meet at a central location – the team with the most items on the scavenger hunt list wins a prize but any teams arriving late to check-in may be disqualified. Some of these items may require money so set each team up with a small budget. 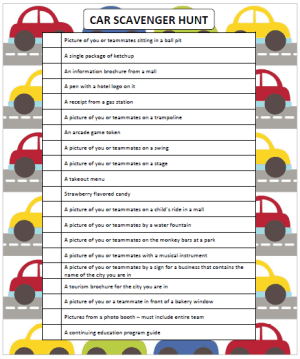 Click here for your free printable Car Scavenger Hunt game. Here’s a sneak peek of some of the items you’ll find on the free printable game. You’ll want to make sure that each team brings along a camera to capture pictures as evidence that they’ve found each of the items. These also make for great souvenirs after the party to accompany thank you notes. We’re always adding new freebies for family fun. Follow along on Facebook, Twitter, Pinterest and Bloglovin’ for the latest and greatest ideas!